Taking care of your loved ones as we would our own… treating your loved ones like “family” – that is our philosophy. Our goal is to be the provider and employer of choice in the communities we serve. Making a positive difference in the lives of others is our number one priority. The time will come when loved ones will require the help of others to assist with activities of daily living. During this transitional period, it is imperative to have a caregiver who is patient, compassionate, and professionally trained. At Healthcare Etc, we treat each client as we would want our loved ones to be treated. 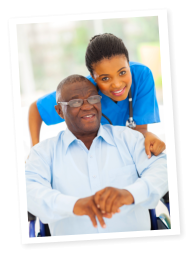 Healthcare Etc In-Home Health Care believes home health care professionals should provide care and support to the elderly members of the community and those physically disabled. We believe in care filled with kindness, respect, and dignity. One of our key principles is to show the utmost respect to our clients because they deserve the very best and should be treated as family.